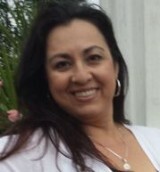 Blanca Ramirez-Salazar holds a master’s in community and regional planning and a bachelor’s in social work. She is bilingual in English and Spanish and has worked for years to support Nebraska Latinos and other immigrants in positions with the Nebraska Equal Opportunity Commission and the U.S. Census Bureau. Currently she is employed with the Nebraska Department of Health & Human Services as a Health Program Manager-Native American Health Liaison for the Office of Health Disparities & Health Equity.